Review by AllTheBestFights.com: 2017-07-08, pretty good fight between Anthony Pettis and Jim Miller: it gets three stars. The black belt in tae-kwon-do and former Ufc Lw champion Anthony Pettis entered this fight with a pro record of 19-6-0 (84% finishing rate) and he is ranked as the No.8 lightweight in the world (currently the #1 in this division is Conor McGregor) but he won just one out of his last five bouts, against Charles Oliveira (=Pettis vs Oliveira). 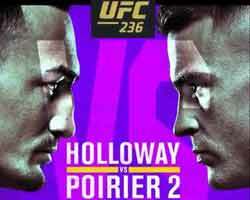 After this fight he was defeated by Max Holloway (=Holloway vs Pettis). His opponent, the black belt in Bjj Jim Miller, has an official mma record of 28-9-0 (64% finishing rate) and he entered as the No.20 in the same weight class but he comes off the loss against Dustin Poirier (=Miller vs Poirier); before this bout he had beat Thiago Alves. 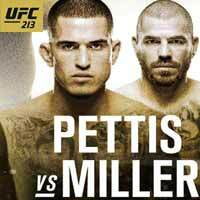 Anthony Pettis vs Jim Miller is on the undercard of Yoel Romero vs Robert Whittaker – UFC 213. Watch the video and rate this fight!